Did you know you can now order your Deliveroo takeaway from Firecracker here on View? What did you think of Firecracker? Sitting in the heart of Westminster, you can all too easily miss the entrance to Firecracker as all there is to denote its existence is a glass door with red writing, which certainly adds to the intrigue as you descend the ensuing stairs. Stepping into a dimly lit room replete with low hanging light shades and minimalist, dark tables and chairs, accents of red give the room a bit more energy and warmth. Little tea light candles sit on each table, a few faux-Chinese firecrackers hang down to the floor and Jenga-like dark wooden partitions separate tables lined up against the wall. Three attractive karaoke rooms are also available for private hire, but don't worry - they boast soundproof doors and windows to protect other diners’ ears and, indeed, one's dignity. 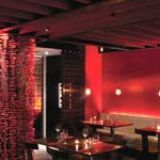 A lively destination venue for the nearby Burberry and Channel 4 crowd, Firecracker attracts an upmarket and affluent mix, without venturing into the realms of pretension or snootiness. 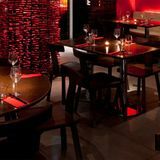 The staff are extremely attentive, quick to replace dropped napkins or chopsticks and to top up glasses. Chilled out house music plays softly in the background, helping the relaxed, easy-going vibe. Keep an eye out for the dishes with stars by them - they're recommended for a reason. The lobster salad is simple but utterly delicious, with a mixed-leaf salad surrounded by meaty chunks of fresh lobster, dressed in a soy and rapeseed dressing. The crispy squid with spicy salt (£5.50) has a wonderfully light crisp batter and a perfect hint of heat, and the seafood fried rice (£10) arrives wrapped in a soft egg nest and is filled with juicy prawns and squid - it's just a shame that the XO sauce (a Guangdong favourite) doesn't seem to add a great deal to the dish. Despite the pan-fried duck breast (£16.50) being ever so slightly dry in the middle, it makes a great dish with the sweet teriyaki sauce offering moisture and crunchy Chinese broccoli texture. The absolute winner, though, is the Wagyu bavette (£22.50). Unbelievably tender and succulent, the beef is slow-cooked and served with a well-balanced five spice jus. 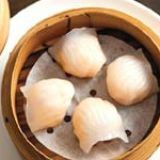 The Chilean sea bass (£23.50) is a traditional Chinese dish cooked to perfection, with the beautiful white, flaky fillet sitting in a ginger and spring onion soy sauce. The tofu with enoki mushrooms (£9.80) is a great vegetable hotpot, with really fresh and silky tofu lightly fried and tossed with stringy enoki mushrooms in a tasty toban sauce. For dessert, a twist on the traditional works well, with a ginger crème brulee (£5.50) and a green tea crème brulee (£5.50) being particularly good. There's enough boldness of flavour from both the ginger and the green tea in each, and the accompanying apple sorbet offers a pleasing little refresher for the palate. Expect a very decent drinks menu with a good amount of variety. If you're going down the cocktail route, then the Firecracker Royale (£8) is a little on the sweeter side than a usual Kir Royale but still very drinkable nonetheless. The Rum Bob (£7) tastes of the summer, with rum and orange, pineapple and lemon juice working together to create a zesty tipple. Wines include a perfectly decent house - the Mendoza Heights sauvignon blanc (£17/bottle) is a pleasant drop that pairs well with most of the dishes, including even the spicier ones. 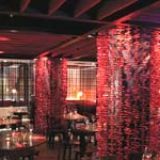 Firecracker manages to feel contemporary without losing the traditional, authentic elements that make Chinese dining so popular. Praise be, then, to all that soundproofing. I cannot understand the negative reviews; I have never had a delivery from Firecracker or the lunch menu, but I have had nothing but amazing food and service when eating in. What sets this apart from other restaurants are the starters and side dishes. Please try the jasmine smoked ribs, inside out chicken wings and the numerous skewers. You will thank me! The service is extremely attentive; without being pushy and what also makes the difference is that this continues after you have paid the bill. Your water and/or your exotic teapot will be refilled until you leave. A far cry from having service suddenly cease as soon as you have paid and sometimes feeling like you are being pushed out of the door; like a lot of other places. This is a place that my other half and I like to take friends when they visit. We go to dinner at least fortnightly to recommended places, including those with michelin stars, this is somewhere that we know we are guaranteed great food at a very reasonable price. We feel proud to have this close to where we live and want to see it do well. We have many wonderful restaurants in the area, but this is something special. Just had the second almost inedible delivery meal from Firecracker. Chicken and cashew nuts: chicken was hard and tasteless and there were chunks of some orange vegetable which were undercooked and really unpleasant. The last time I ordered, I asked for sweet and sour chicken - the most basic dish in the Chinese list! Again, the chicken was tough and tasteless and the sauce lacking in flavour.